The dividend kings index includes companies which have managed to increase dividends for over fifty consecutive years. A company that regularly raises dividends to the tune of fifty years in a row is the type of company that every serious dividend growth investor should study. It's also important that the dividend kings are able to grow further in order to generate a return for its shareholders. But you must be careful to judge the companies growth. There are several ways to generate earnings growth, remember share buybacks or extraordinary one off items. The true growth comes always from sales growth and higher market share while margins are stable or improve. It’s always interesting to look at companies’ sales growth, because the usual quarterly focus on whether companies beat or miss consensus earnings estimates doesn’t really mean anything. A company can “beat” the (recently lowered) estimates while showing a major earnings decline. A company can also experience a one-time even that can skew earnings for a quarter or a whole year. It’s more useful to look at sales growth. 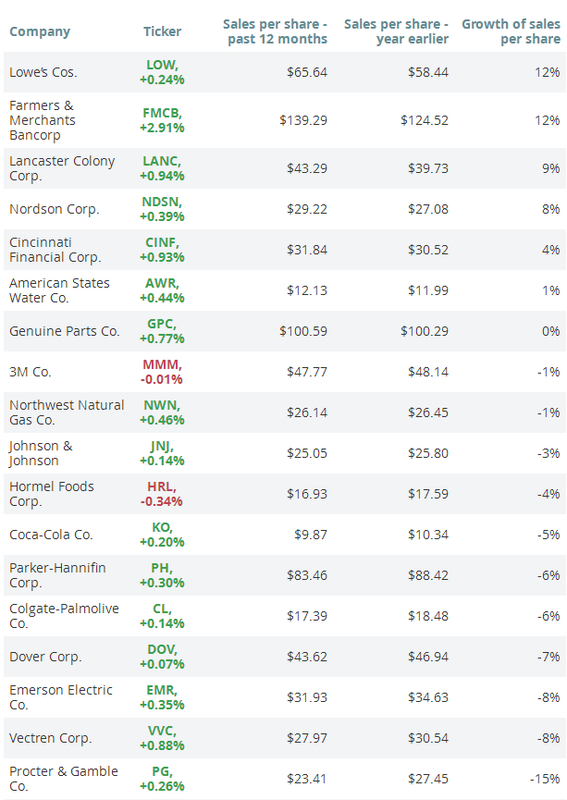 Source: Sure Dividend, Factset, MarketWatch.